Throughout the Bible, we learn of an infinite God, who is totally good. It is evident from studying the Scriptures that the Bible writers, prophets and disciples were gaining a growing appreciation of the omnipotent goodness of God. Jesus illustrated God’s omnipotence, by healing everything that was not good, whether in the form of sin, sickness or even death. Through her study of the Bible, Mary Baker Eddy discovered the spiritual laws which Jesus used to restore health and harmony, and found that these laws are just as effective today to bring healing as they were 2,000 years ago. Christian Scientists turn to the Bible to study the deep divinity of God. Our definition of God as “The great I AM; the all-knowing, all-seeing, all-acting, all-wise, all-loving, and eternal; Principle; Mind; Soul; Spirit; Life; Truth; Love; all substance; intelligence” (Science and Health p587), echoes the references to the “seven Spirits of God” in Revelation. The seven capitalized synonyms are names for God found in the Bible — with the exception of Principle, which God’s role of Creator and Law-giver implies. We see Christian Science as the law of Christianity, which governs all reality. The Master Christian, Christ Jesus demonstrated this law when he healed the sick and the sinning. Mary Baker Eddy defines Christian Science as “the law of God, the law of good, interpreting and demonstrating the divine Principle and rule of universal harmony.” (Rudimental Divine Science p 1). Mary Baker Eddy, the Discoverer and Founder of Christian Science was born in 1820. Her early childhood was spent on the farm of her parents, in Bow, New Hampshire. They were deeply religious and the Bible and prayer were the focus of their lives. As a child Mary possessed a great spiritual thirst, a sharp intellect, and a love for people. She alone among her six siblings applied for and was accepted into membership in the Congregational Church in 1838, despite her refusal to accept the doctrine of foreordination. In 1843, Mary married, but was widowed the next year. Her only child, a son, was born that year. A combination of events including her continuing ill health led her family to place her son in the care of others in 1851. She lost all contact with her son and didn’t see him again for almost 30 years. Her sufferings from circumstances such as these, as well as from the ills of the flesh, drove Mary more deeply into the Bible as she sought the healing Christ. This led to her discovery of Christian Science in 1866. That year she was seriously injured when she fell on some ice and her doctors did not expect her to recover. Later in the day she asked to be given her Bible, and turned to one of the healings of Jesus. As she read, the words of Jesus “I am the way the truth and the life: no man cometh unto the Father, but by me.” (John 14:6) flooded into her heart and thought. She was suddenly filled with the conviction that her life was in God – that God was the only Life, the only I AM. And in that instant she was healed. After three years of searching the Scriptures, reading little else, she wrote and published the Christian Science textbook, Science and Health with Key to the Scriptures. She described this search as “sweet, calm and buoyant with hope, not selfish nor depressing.” (Science and Health p109) She later founded and established the Christian Science Church together with its periodicals, the weekly Christian Science Sentinel, the monthly Christian Science Journal, and its world renowned newspaper The Christian Science Monitor. Mary Baker Eddy passed away in 1910. The trilogy by Robert Peel: “Mary Baker Eddy: The Years of Discovery”, “Mary Baker Eddy: The Years of Trial” and “Mary Baker Eddy: The Years of Authority”. Christian Science and It’s Discoverer. by E. Mary Ramsey. What is the relationship of Christian Science to the Bible? To the Christian Scientist the Bible is the source of all Truth. It explains life and salvation, explains the Way of Life exemplified by Jesus, which he commanded all Christians to follow. 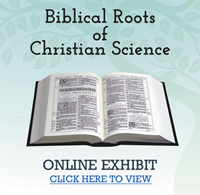 Christian Science was discovered through deep study of the Bible. The Bible is read at all our church services and is the foundation of all the teaching in our Sunday School. Mary Baker Eddy wrote Science and Health following extensive study of the Bible. Her book helps us to understand the Bible better, enabling us to practice its precepts more fully, and to follow our Master’s healing example. Mrs Eddy ordained the Bible and the Christian Science textbook, Science and Health, as our dual pastor in 1894. Our services have no personal preaching but instead include a Bible Lesson comprised of readings from the Bible and correlative passages from Science and Health prepared by the Bible Lesson Committee at The Mother Church in Boston. This format is used both at our Sunday Services and our Wednesday evening meeting. Are there people in the church that heal people in the public? Yes. Christian Science practitioners are people who dedicate their lives to the full time healing practice of Christian Science. A list of these individuals can be found in the Christian Science Journal, copies of which can be obtained from our Reading Room, and online at csjournal.com and any local phone book. Practitioners living locally are listed under Pasadena, but there are no geographic limits on where a practitioner may practice. What is the difference between Christian Science and Scientology?